Mr. Van Rompay has been researching, gathering information, testing and developing a non-toxic coating and an in-water cleaning system since the early 1970s when he first saw disaster in the making as a result of biocidal antifouling coatings in use on the majority of vessels afloat, pouring TBT, copper, zinc and a variety of poisonous substances into the oceans where these substances continue to pollute the water and persist in the sediments at the rate of hundreds of thousands of tons every year. A non-toxic, glassflake alternative coating was brought to the market in 2003 and has been in use on a growing number of ships, boats and yachts since then. The coating is designed to last the life of the vessel, thus avoiding the environmental and economic hazards inherent in the frequent replacement model of conventional antifouling paint. Biofouling is kept to a light slime at most, greatly reducing the fuel penalty, saving large amounts of fuel and thus cutting GHG emissions by 20% or more. The coating system combined with in-water cleaning is also designed to eliminate the spread of invasive alien species without the use of toxic substances. This book will be of particular interest to shipowners and operators, charterers, naval architects, legislators on marine and environmental issues, non-governmental organizations concerned with the marine environment, port authorities, scientists and students engaged in hull protection and antifouling research. 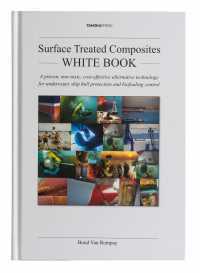 The Surface Treated Composites WHITE BOOK – A proven, non-toxic, cost-effective alternative technology for underwater ship hull protection and biofouling control, is available in hardback format directly from Tahoka Press (www.tahokapress.com) at a reduced introductory price valid until the end of 2012.